What were you thinking that Saturday night in early January after UMD scraped a two point weekend from the basement dwelling CC Tigers? Here we go again? Just a bump in the road? Who are these guys with Bulldog jerseys on? Luckily UMD bounced back showing that it was a bump in the road. But another bad weekend could be a blueprint for opponents moving towards playoff time. 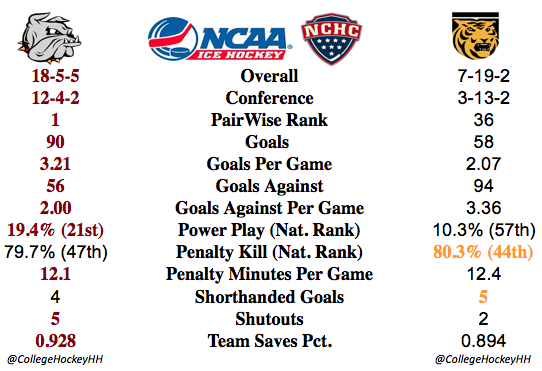 It must be a good weekend for UMD, a sweep most likely, to keep hopes of an NCHC title alive. A sweep would also be beneficial coming off of a bye weekend setting the stage for the end of regular season run. Tonight's game for the Bulldogs marks the final stretch run and the Bulldogs now find themselves in second place in the conference. At this point if they want to take the home the Julie and Spencer Penrose Memorial Cup they just may need to win out. 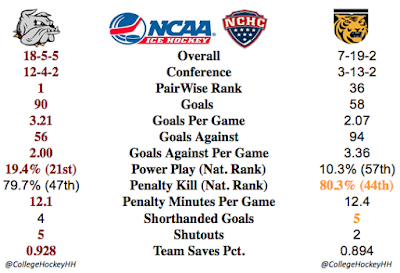 Minnesota Duluth @ Colorado College: This rematch is very important series for the Bulldogs. I think the rest from the break and now on this road will result in a sweep. North Dakota @ Western Michigan: The Fighting Hawks have been a little streaky this year and going to the Harry W. Lawson ice area will not be easy. The Broncos have been great at home this year, but I think the Fighting Hawks will steal one and get a split. Denver @ Miami: The Redhawks are a much better team at home then on the road, but the Pioneers haven't showed much weakness this year. My gut says this will be a Pioneer sweep. I love hockey and it the national game of my country yet nobody celebrates it like you guys do. After reading about you old experience I wish something like this could happen here.